with Marian and her band of Qwazy Quilters! Choose your own "Qwazy", and I'm in on that challenge. I do love a good scrap buster. That's the "Qwazy" in me. 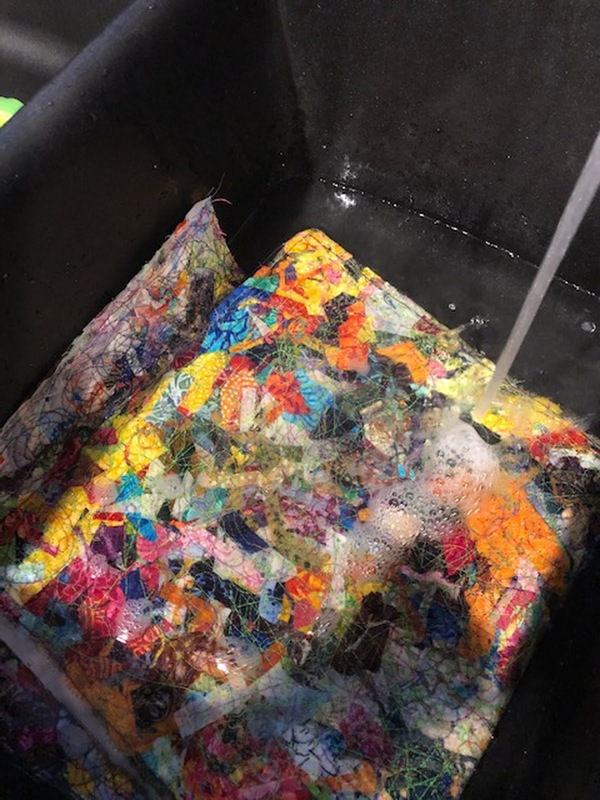 This years "Qwazy" started with a bag of my "Island Batik" scraps. I guess I shouldn't really call them scraps, they were more like shards. But, they are just so pretty, I couldn't throw them away! So, I encased them, between 2 layers of a sticky water soluble stabilizer. That's when it all went downhill. My little "pillow of scrap" was too thick for my sewing machine to sew through. Needles broke, words started to fly. It didn't like it anymore than the sewing machine did. 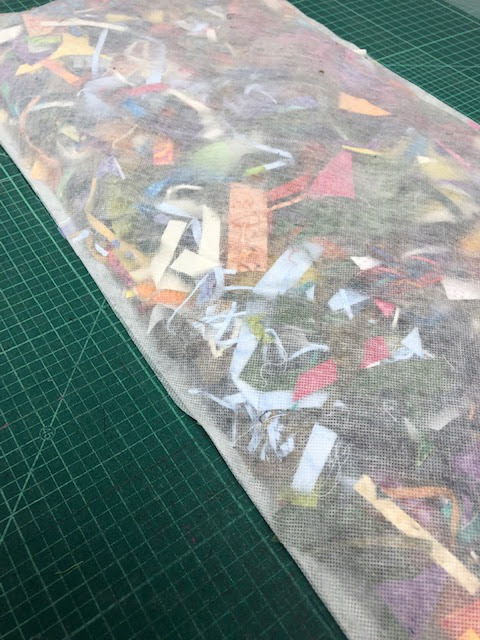 then pick and cut out many of the scraps. Oh these brilliant ideas I have some days! and was pleasantly surprised, when I put it in water. As the stabilizer melted away, this wonderful new fabric started to emerge. 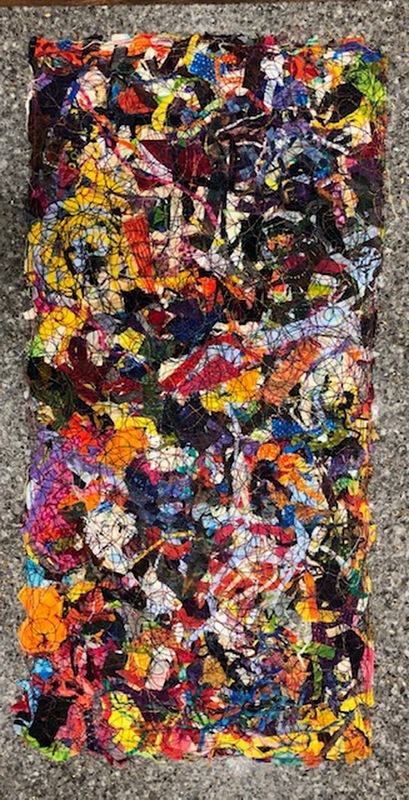 What I have now, is this fun 12"x24" piece of "Island Batik"
it's going to be fun to figure out a project for it! But there is just something about "scraps", that calls to me every time. This scrappy log cabin is all in 1" strips that finish at 1/2". and even the contractor commented, that I had lost my mind! This monster stash buster is an oversized, reversible California King. Besides busting through tons and tons of scraps...It's so heavy, that if we loose power in the dead of winter, we will never freeze as long as we have the muscle to get the thing out and onto the bed! 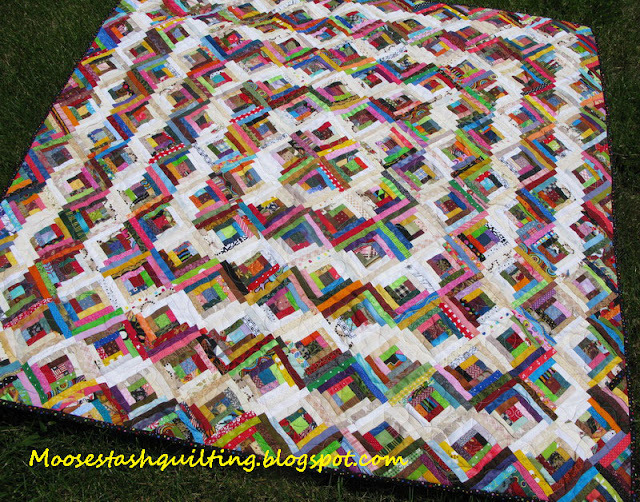 There was this fun string quilt from my "Fabulous Freebie" blog hop last year. I don't think Bonnie had real Orcas in mind, when she designed it. I doubled the size and added the big border. One last little "Qwazy" photo. A peek into my Quilt cabinet. Oh, how I wish I could tell you this is the only place they are stashed. But it's finally cleaned out enough to show you! 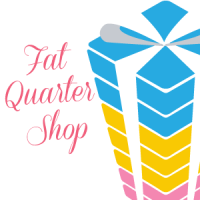 A big thanks to the Fat Quarter shop for a couple of great giveaways! It's not too late to enter in a giveaway from Annies Craft Store. You have until 11:59pm tonight to enter. Check out my previous post and read all about it. Wow, you showed us one challenging/qwazy project after another, but the batik collage cloth is really amazing. That would make a beautiful wall-hanging with maybe just some sort of border. That is so cool. I’m doing a deb tucker pattern right now and have a huge bowl of trimmings. I think I have to go get some melt away stabilizer. Thanks so much for the idea! Wow, I love your projects. I, too, made a fabric scrap like you did, but I just made a coaster!! Love your Orca Bay and the orca borders! Thanks for showing your Qwazy! I love Orca Bay! Thanks for sharing! Very nifty idea with your "disposable" scrappies. I've only recently started using those shards to stuff into little pin cushions and adore the weight of them when they are stuffed tight. Orca Bay is amazing!!! such a genius idea to have them swimming around the bed! oh my what a wonderful post of yummy. you have done marvelous with your scraps. isnt it fun to do something that makes someone else say, "your nuts"? LOL i love it. 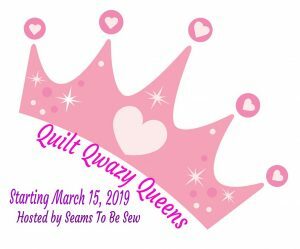 Love your qwazyness and your quilts are amazing! Thank you for sharing! Love your quilts. They are all so gorgeous. Your batik created fabric is so fascinating. I look forward to seeing the finished project. I throw all the little pieces, I don't keep selvages and even 2-1/2" squares drive me Qwazy. You have shown amazing creations, we all realize what long and hard work, albeit enjoyable, it takes to make those quilts. Evidently you like challenges! I'd have lost my mind over that log cabin, but it's beautiful! The Island Batik piece could be a table runner on a smaller piece of furniture. Nice quilts, love the addition of the Orcas. I love reversible quilts. Enjoyed reading the post. Looks like my UFO cabinet. I need to finish some, but I keep seeing new ones I want to make! Love that Orca Bay with the orca border! I love your Island batiks "fabric"....use it as a center medallion? Your scrap quilts are spectacular! 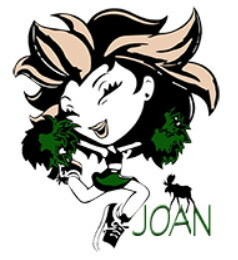 Wow, Joan! What a great idea to use your "chards" and create new fabric! Too bad your machines didn't want to cooperate at first, but glad you finally got it. Now I want to see that finished project with it! LOL I have to say I agree with your contract about the strip quilt that finished at 1/2 inch! Thanks for sharing your "crazy" with us!! There definitely is something about scrap quilts - lovely finished creativity & to think you doubled one in size! I love scrap quilts! Thanks for sharing your craziness! 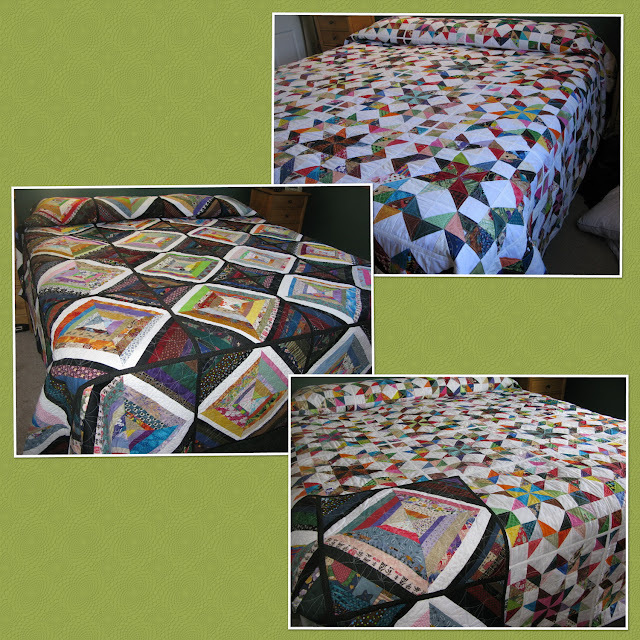 I love making scrap quilts too and have made 8-10 of Bonnie Hunters patterns. I think your small pieces look like a fancy art quilt. You should hang it as is! Absolutely love that log cabin !! The scrap project is wonderful, if I had any wall space.... I'd have to borrow that idea. I'd hang it as is. Haha, your scrap bag looks like mine. How small is too small? Cute collage but I don't think I would have tried that. I have thought of using scraps for pillow stuffing though. I love that Log Cabin. Wonderful. I use the tiny scraps to fill dog beds then donate. 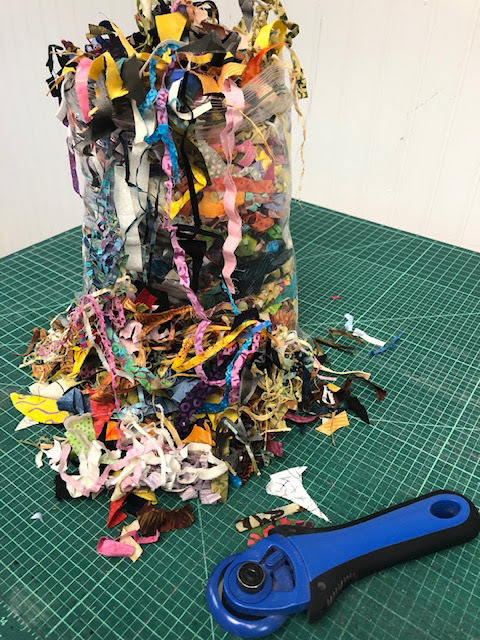 Love your idea of using the wash-away stabilizer to create fabric out of shards!! Just need to not make a pillow out of it!! Love your quilts...you are quilting qwazy!! Ummmm Has anyone ever told you that you are crazy.....you are.....in such a fabulously creative way!!!! :) Thanks for sharing. Joan, you qwazy kid! Thanks for taking us through your scrap-crazy virtual quilt show. I would love to see all of those quilts in your closet! So fun! Scrap quilts are the most fun (not that I'm a sane quilter by any means!). Your 'created' fabric would make a wonderful purse I think - and thank you for the reminder of the technique. I'm hunting for an idea for making tree tops for my current project and that might end up being what I do. The idea was perfect, it was just the machines that would not cooperate. Great result with the scraps! I love all of the quilts you showed. One year I brought tulle and just encased it in that and made a little bag, I love what you have done.